If you have a passion for nail polish and need some extra income, making your own nail polish at home may be the small business for you. You do not need a large space to manufacture your nail polishes, though you will need a workspace with excellent ventilation. Creating the perfect custom colors will take experimentation, so start with small batches and see what your customers and friends respond to before filling five dozen bottles. 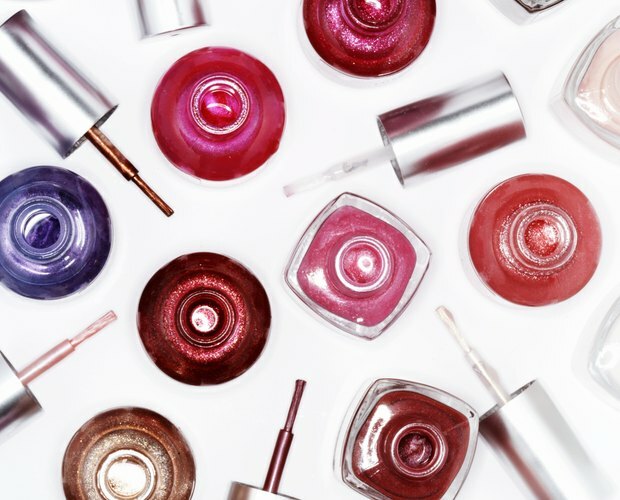 Purchase bulk orders of clear nail polish and nail polish bottles at a local beauty supply store or online. Create palette of colored mineral powders and fine glitters. Choose a few colors you want to use alone or purchase a variety of colors to mix and create unique colors for your own line. Prepare a sterile workspace. 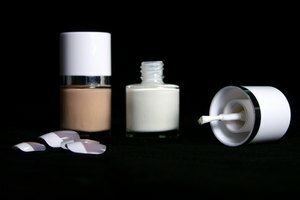 Because you will be selling your product, you want to ensure as little contamination of the nail polish. Wipe down all surfaces and clean your utensils prior to beginning your preparation. Open only the mineral powders you will be using for a particular batch of nail polish. Add mineral powders or glitters to the clear nail polish according to your recipes. If you are experimenting, add small amounts at a time and write down the final amounts of each powder or glitter you use to achieve the desired color. Mix the nail polish thoroughly with a glass stirrer. Pour the nail polish into empty nail polish bottles with the aid of a small glass funnel. Wipe up any drips with a cotton ball soaked in acetone. Rinse the beaker, stirrer and funnel immediately with acetone. All utensils can be rinsed over a household sink with plenty of running water. Acetone air dries quickly so you can reuse utensils immediately for your next batch of nail polish. Dip a cotton swab in one of the colored powders and tap a small amount of the powder onto a glass plate. 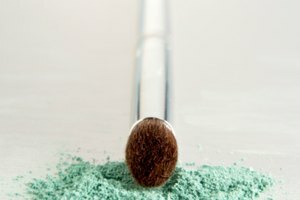 Repeat Step 1 for all of the colors you would like to blend and lightly mix the powders. Place a drop of clear nail polish over the powder and mix it into the powder. Use the cotton swab to paint a streak of the new polish onto your nail and allow it to dry. You will still have to experiment on a larger scale to get the exact color, but you can see if the colors complement each other to avoid making a large batch of a bad color. Rinse the glass plate with acetone. Work quickly and only make one batch at a time. The clear nail polish will congeal quickly and become more like sludge than nail polish if left to sit. Less powder will produce a more translucent nail polish, while high concentrations of powder will produce opaque nail polishes. Glass stirrers, funnels and beakers will need to be purchased from a scientific supply company. Familiarize yourself with all FDA, local and state regulations regarding the sale of homemade cosmetics.